commercial quality double sided, solder masked and silk screened pc board. The attenuator uses a pi net work of 2W resistors, and will handle 5 W.
make very low power contacts. Check out the manual at www.qrpkits.com. Click here for Hendricks QRP Kits. 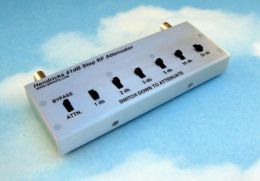 This entry was posted in Announcements, Kits, News and tagged 41dB Step RF Attenuator Kit, Hendricks QRP Kits. Bookmark the permalink.